Straight from the personal collection of freevintageillustrations.com, this free vintage Christmas illustration is ideal for nature lovers and bird watchers. 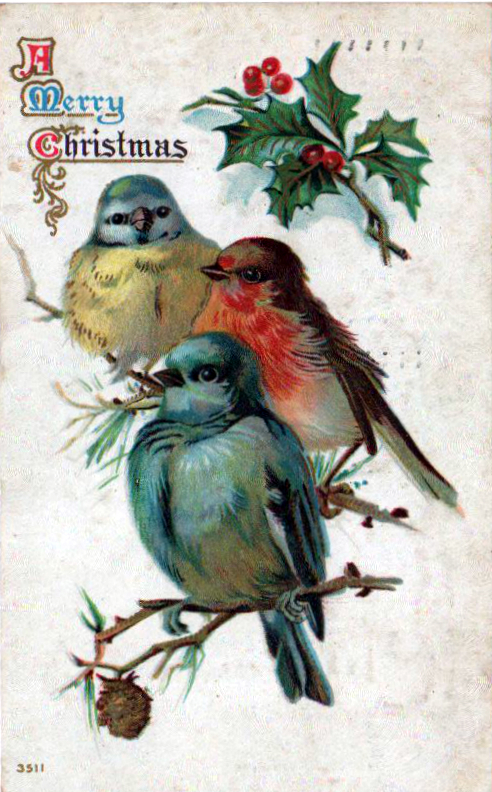 Dating to the very early 20th-century, this antique greeting card features three colorful birds perched on a branch. Complete with Christmas holly and pine cones! For more free nature images, check out the complete nature illustration gallery or animals collection. You can also find more free Christmas illustration and in free Christmas image Library as well. For exclusive vintage illustration that you can’t find on the site, make sure to like and follow on Facebook!